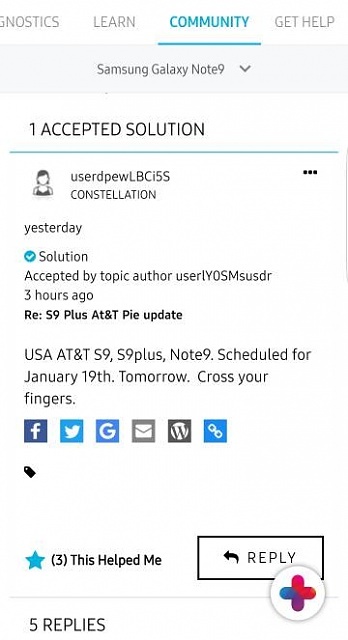 Saw a post in the Samsung+ app about AT&T S9, S9+, and Note 9 being updated on the 19th. Hopefully it's a release for all carriers in the US. I have Sprint. Anyone else hear anything? Beansr519 and smooches680 like this. I'm not looking forward to it. I'm afraid I won't be able to change the quick settings icons from the blue, bubble icons of Pie. I really don't like those. That's the one thing I despise about this update. The only official confirmation I've seen from Samsung is that January 2019 is the schedule. The rest is pretty much here say , rumour and Chinese whispers. For me the Security Updates are priority. It's available for downloading/installation now on my phone. Came in about 6 hours ago. Even though I really want DARK MODE I'll wait about 2 weeks and see the forum comments. Won't the themes change those like they do on Oreo? Just received Dec 1 security update a couple days ago. Cannot imagine this would come so soon. Nigeria. I have an unlocked 128 GB Exynos Note 9. I'm looking forward to Pie on my Note 9, which is really rocking. The best phone I've had personally. I'm on ATT. no update yet. I did t see anything on Samsung plus about this. Can you post screenshot? It was a post in the S9 forum. AT&T Note9 here, no sign of Pie update. US model haven't received roll out yet only international version. No one at Sprint knows anything about the update. They just want us to buy the newer phones. My note 9 running flawlessly I'm upgrading to the note 10 anyway and will keep my note 9 as a back up. Eyeing a OP7 when they come out as well. Fine with the Oreo have no idea on updating to pie.